Industry trendsetters and followers are planning their outfits and schmooze scripts to attend Mercedes-Benz Fashion Week in New York next Thursday. Absent from the main runway shows posted online, is the Asian stylista we’ve been watching on cable TV ever since she learned to sew. If ‘Under The Gunn’ mentor Anya Ayoung-Chee feels the pressure of the streets talking, she knows the clock is ticking for those eager to buy her collections off retail racks in Saks or H&M. Till then, Anya gets to cultivate a fan base by inviting prospective clients to survey her process and rational via reality TV. 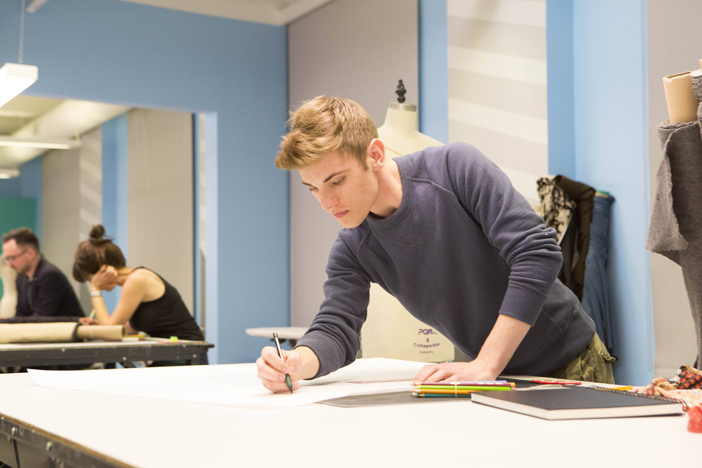 In the first challenge to threaten elimination of a mentor on Project Runway: Under The Gunn, the12 designers were required to create a red carpet look in one day after an inspirational tour of the textures of Hollywood. Some designers were clueless that the show is partly based on the premise of executing one’s imagination under the pressure of time constraint. Mentors Mondo Guerra and Anya supported their designers in delivering their individual interpretation of glam. While mentor Nick Verreos got too hands-on and caused Mr. Gunn to stab a stiletto into his over-draped dress train. “Nick is being a control freak, he is micromanaging at a level that I could not even imagine,” griped Gunn. 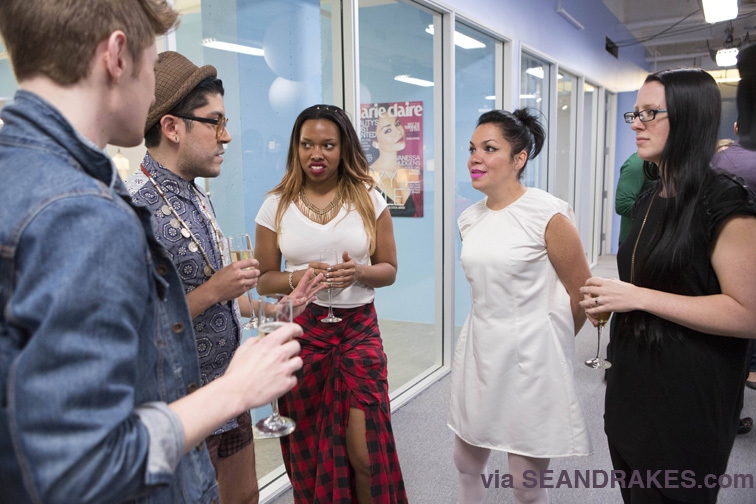 The Mentors: Nick Verreos, Anya Ayoung-Chee and Mondo Guerra in the workroom with Stephanie. Team Anya sailed through judging unscathed. Sam Donovan from team Mondo delivered a two-toned jumpsuit that earned U$5,000 and will be worn by a celeb then published in Marie Claire. For simply making “a pillowcase,” Camila Castillo got that one-way ticket back to Venezuela that her mentor Mondo predicted. Anya counted her lucky stars that three of her mentees chose her over Mondo. She has a strong team that suits her aesthetic and diva-free personality. I can’t imagine her spitting the diva drama reality TV tends to demand, but if she can bring it, I’ll be front row to score her performance. Team Anya: (clockwise) Blake Smith, Brady Lange, Anya Ayoung-Chee, Shay Keith and Nicholas Komor. As we watch Anya navigate the learning curve to becoming a mentor, she has been busy with a crash course on how to broker the appeal of her image. As the Carnival season neared, she allegedly pitched a proposal to install a pop-up shop in a luxe hotel in Port-of-Spain. But donating prime real estate during peak season to the young designer, just to have Anya posing pretty in their lobby, doesn’t put a penny in a hotel’s till. The takeaway for her mentees: assure the deals you spin deliver deposits for all principal players, and skip the request for a discounted room. During her moment in the confessional, mentee Natalia Fedner admitted, “I have to prove to people why I am here.” You wonder if Anya shares that sentiment as she courts investors, shapes her brand, and explores the possibilities of becoming a celebrity. It’s a complex game for a reality TV vixen who can elicit admiration from sharp-witted critics. We’re tuning in to see Anya pattern a strategy to dodge another cut.